Beer is one of those drinks that brings people together in ways that others just can’t. Imagine sitting around a camp fire or a hanging out at a bar with glasses of milk. That’s just weird. To get you all in that togetherness spirit, Vegas is hosting the Downtown Brew Festival, a night of delicious food, craft beers, music and, most of all, connection to Vegas. As the sun fades, the DBF begins. Photo courtesy of Motley Brews. Talking to Brian Chapin of Motley Brews, the crew behind DBF, it’s clear this festival, like craft beer itself, is made through a precise combination of knowledge and passion. “Local breweries are the apex of what a craft beer market is capable of,” says Chapin. “It just takes a little faith and a really good product.” And for beer drinkers, having faith in the local market is easy once you’ve tasted the product. Local Las Vegas beer drinkers are embracing the craft beer scene with gusto. Craft breweries like Banger, Big Dog’s, Hop Nuts, Ellis Island, Old School and so many more have proven themselves time and again. For us, an event like the DBF is about celebrating the beers we love. For tourists, it’s about something Chapin calls the “nature of the explorer.” It’s the act of coming to a new city and seeing exactly what that city has done with the ingredients on hand. “Drinking local is always the freshest in the city. It’s straight from the tanks, no weather, no stress. It’s exactly how it was intended.” For craft beer enthusiasts, that egalitarian view gives hope that taste won’t be overlooked for mass production, thanks in no small part to festivals that recognize its importance. 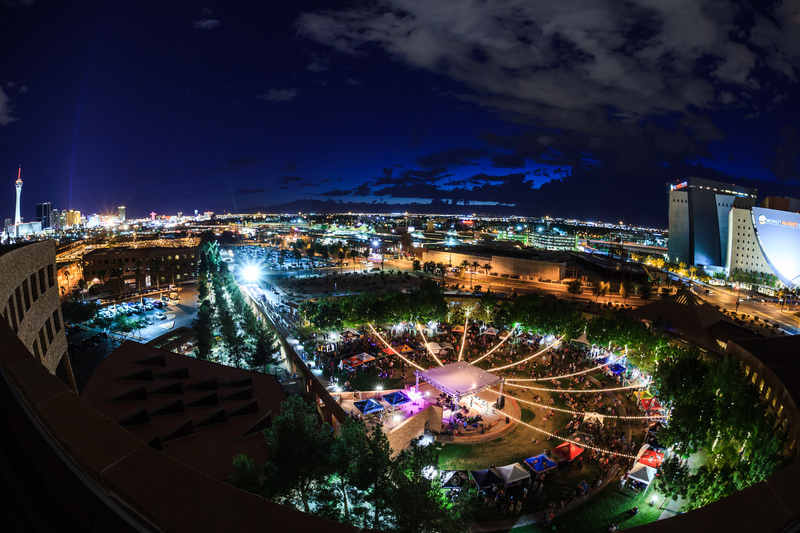 Images like this are one of the many reasons the DBF is held at night. Photo courtesy of Motley Brews. “Great beer will always win,” says Chapin, sipping a particularly delicious IPA at Hop Nuts, “Don’t judge a brewery by spread.” That simple note is precisely why events like the DBF are so significant for a place like Vegas. In a tourist town, local breweries have the opportunity to find a wide audience without having to sacrifice quality or ship products around the globe. That puts Vegas breweries in a unique position to provide tastes you won’t find in any other city. The Downtown Brew Festival is intentionally smaller than other fests in the city. It routinely sells out and it’s kept intimate so that the beer and pairings can shine. 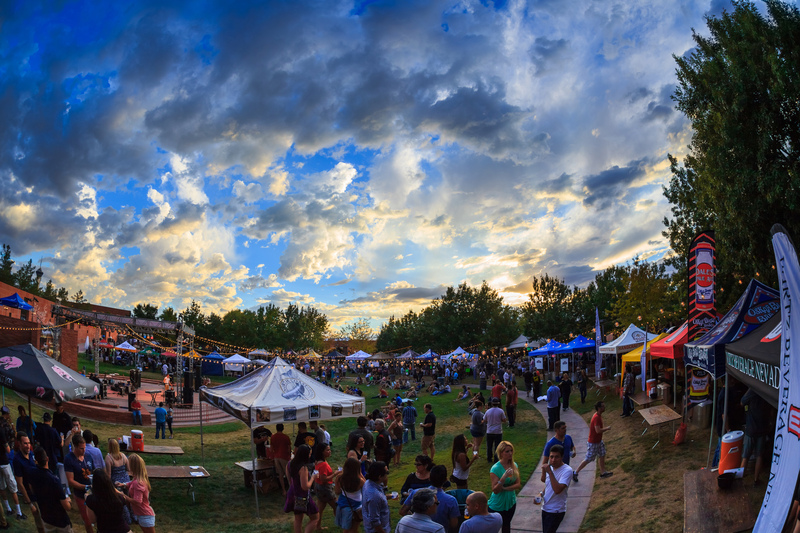 Or, as Chapin puts it, DBF is “a lifestyle event that’s something very different than what you’ll find in Vegas.” But if you love craft beer, know someone who does or are just starting to get into the scene, this is absolutely the place to be. You’ll get to taste the Vegas beer experience, and discuss the flavors and sensations with people who know their stuff. And you’ll get to shove it all in the faces of those silly milk-drinkers with their moustaches and calcium. When: Oct. 24, 2015 from 5 p.m. (4 p.m. for early entry and VIP) to 9 p.m.
Tickets: $40 – $90 purchased from the festival website or at the door.